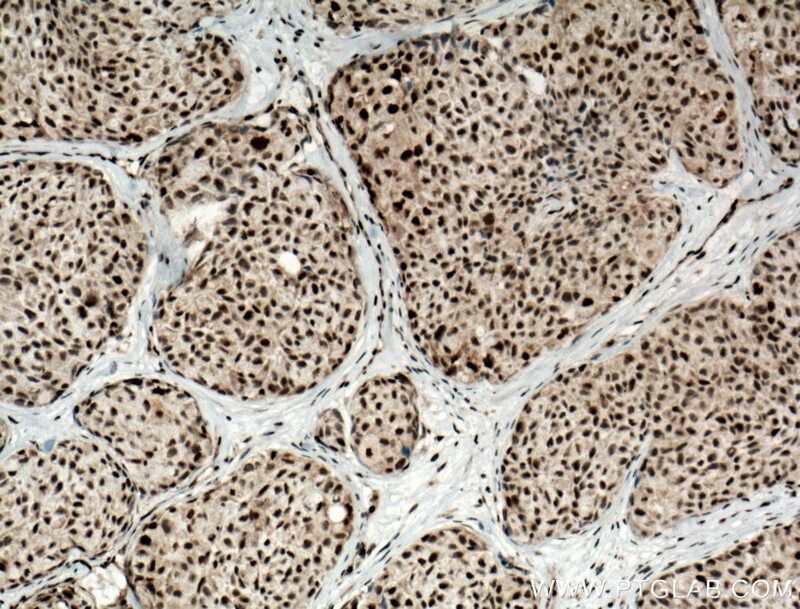 Immunohistochemical analysis of paraffin-embedded human lung cancer tissue slide using 12111-1-AP (DPF2 antibody) at dilution of 1:200 (under 40x lens) heat mediated antigen retrieved with Tris-EDTA buffer(pH9). 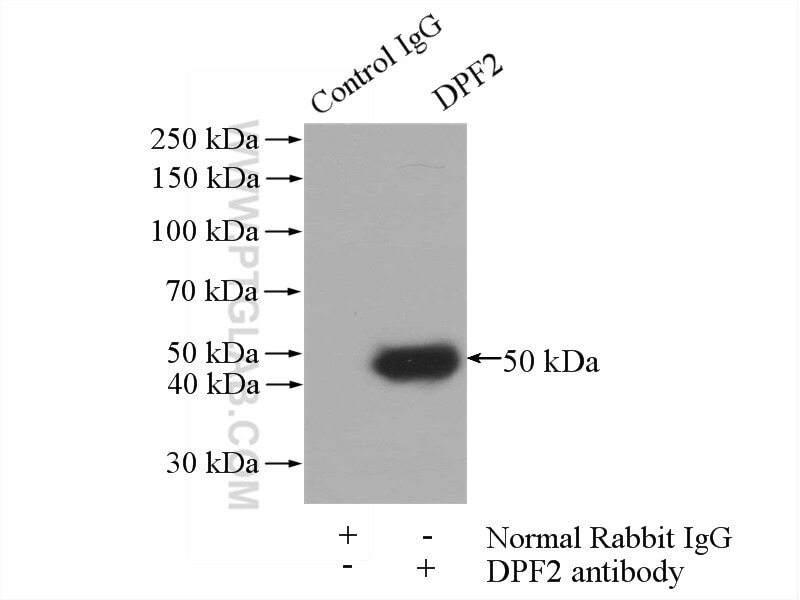 Immunofluorescent analysis of HepG2 cells, using DPF2 antibody 12111-1-AP at 1:25 dilution and Rhodamine-labeled goat anti-rabbit IgG (red). 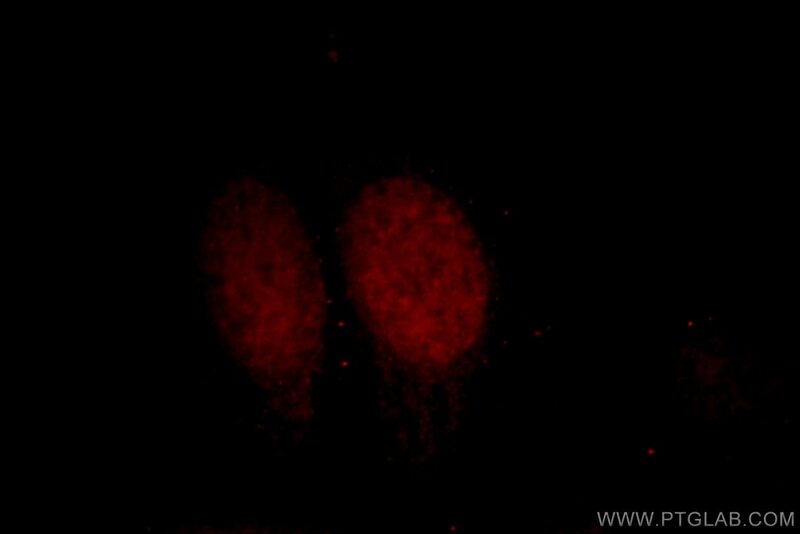 IP Result of anti-DPF2 (IP:12111-1-AP, 4ug; Detection:12111-1-AP 1:500) with Jurkat cells lysate 1200ug. 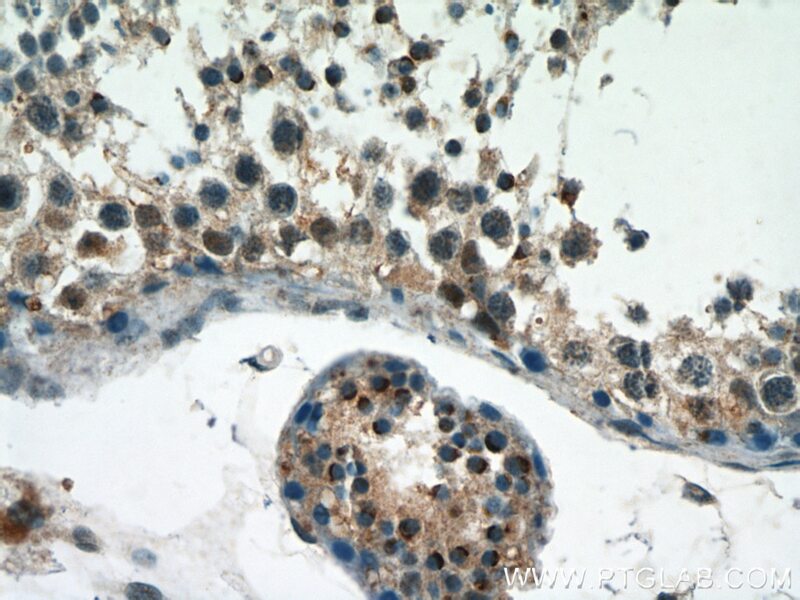 DPF2, also named as BAF45D or UBID4, is a 391 amino acid protein, which belongs to the requiem/DPF family. DPF2 may be a transcription factor required for the apoptosis response following survival factor withdrawal from myeloid cells and might also have a role in the development and maturation of lymphoid cells. 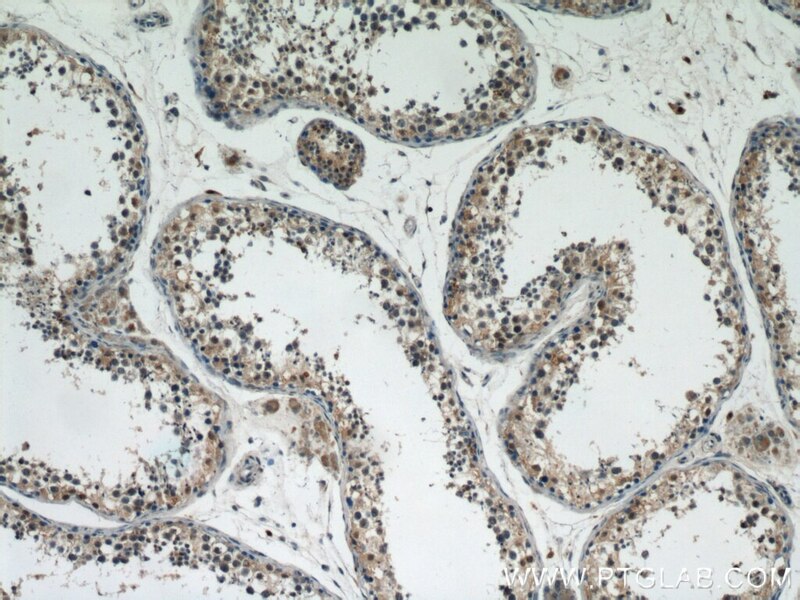 DPF2 was recently shown to inhibit the myeloid differentiation of hematopoietic stem/progenitor and acute myelogenous leukemia cells. The BAF45D Protein Is Preferentially Expressed in Adult Neurogenic Zones and in Neurons and May Be Required for Retinoid Acid Induced PAX6 Expression. DPF2 regulates OCT4 protein level and nuclear distribution. 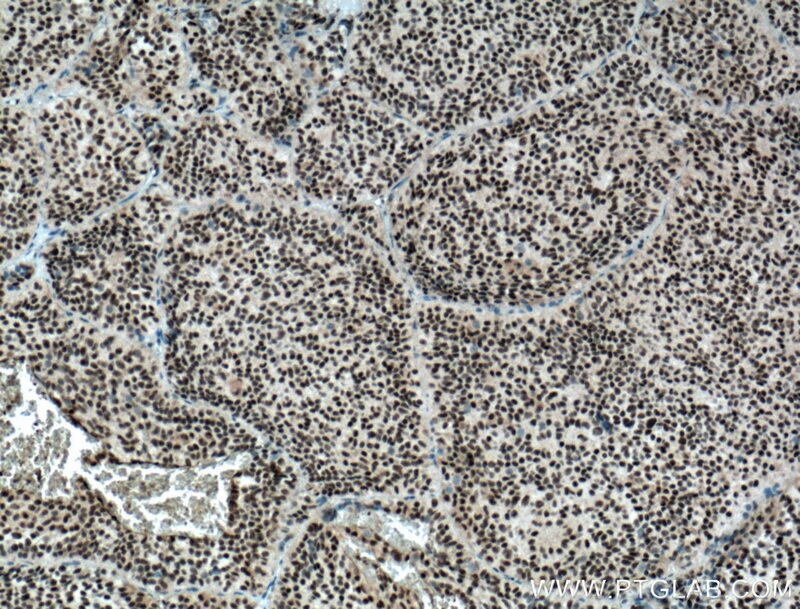 Immunohistochemical analysis of paraffin-embedded human lung cancer tissue slide using 12111-1-AP (DPF2 antibody) at dilution of 1:200 (under 10x lens) heat mediated antigen retrieved with Tris-EDTA buffer(pH9). 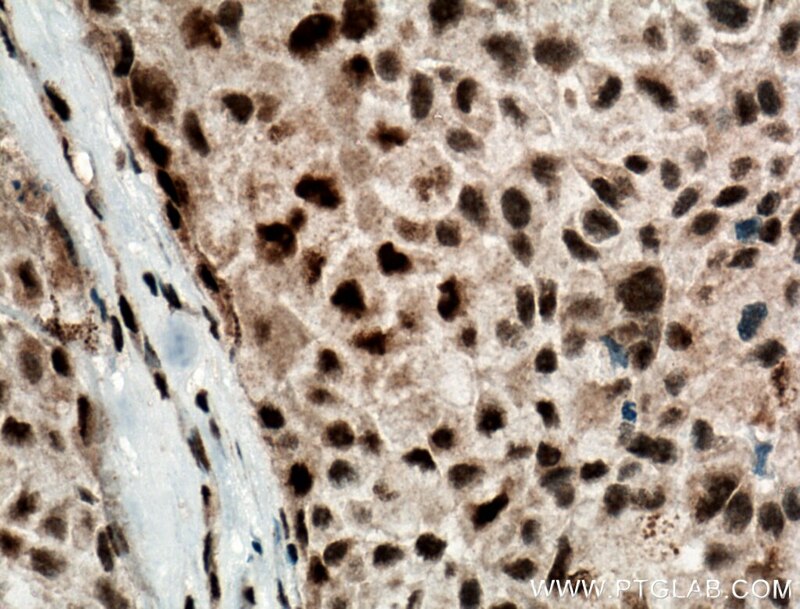 Immunohistochemical analysis of paraffin-embedded human pituitary adenoma tissue slide using 12111-1-AP (DPF2 antibody) at dilution of 1:200 (under 10x lens) heat mediated antigen retrieved with Tris-EDTA buffer(pH9). 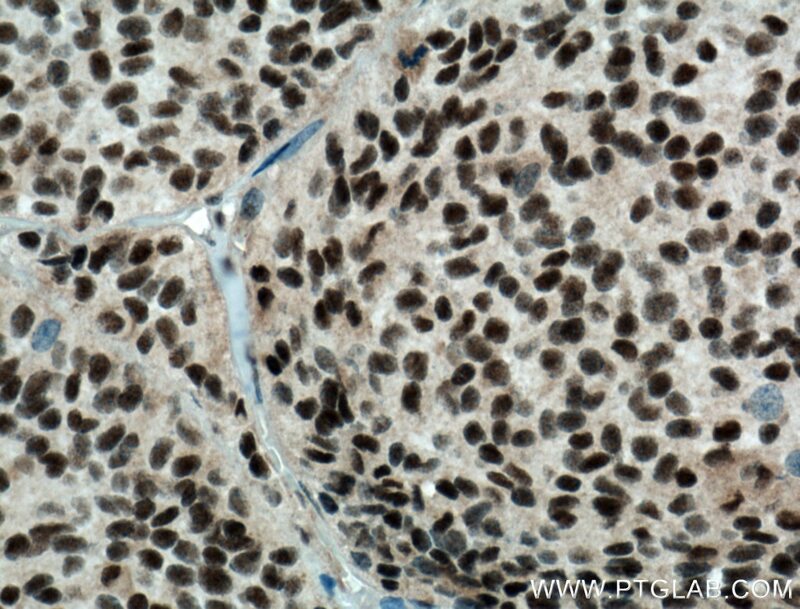 Immunohistochemical analysis of paraffin-embedded human pituitary adenoma tissue slide using 12111-1-AP (DPF2 antibody) at dilution of 1:200 (under 40x lens) heat mediated antigen retrieved with Tris-EDTA buffer(pH9). 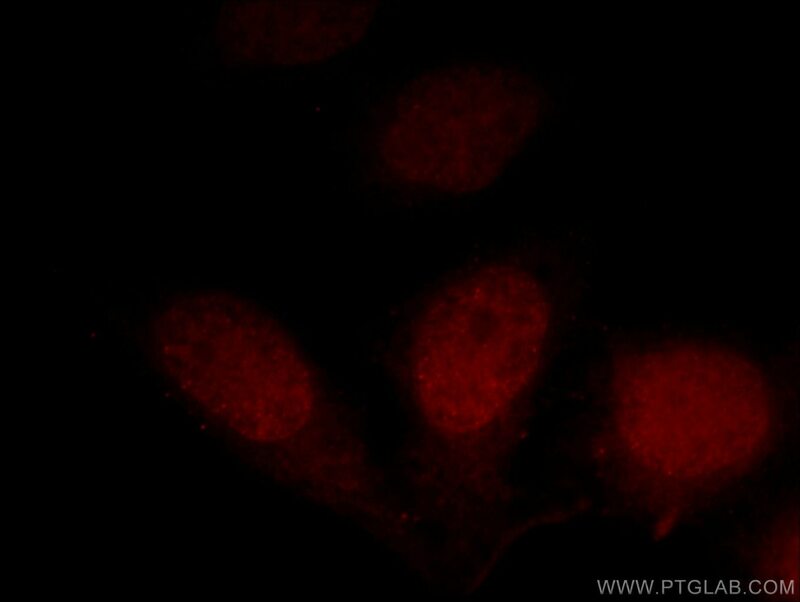 Immunofluorescent analysis of Hela cells, using DPF2 antibody 12111-1-AP at 1:25 dilution and Rhodamine-labeled goat anti-rabbit IgG (red).